Madeleines are one of those classics of French Patisserie, found throughout France in pastry shops, cafes and bistros. The tiny, melting textured cakes are simply delightful and certainly go up a notch or two when made with dark chocolate. 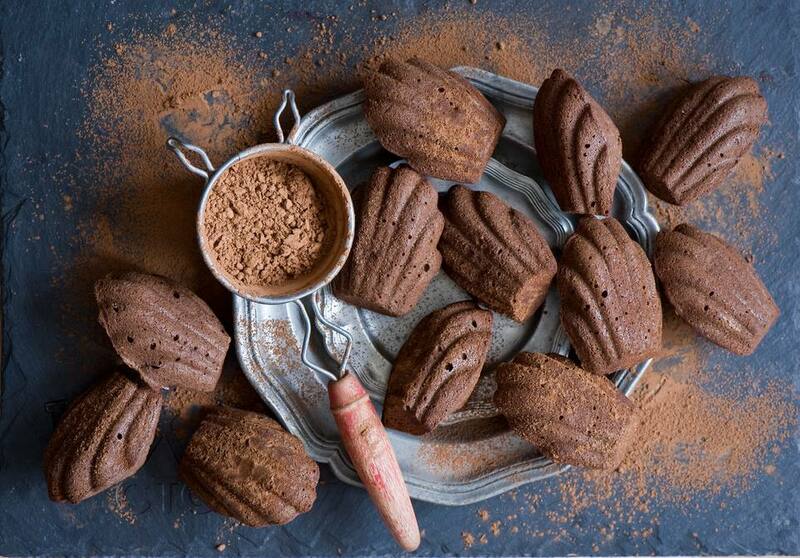 These chocolate madeleines are a chocolate lover's dream come true. Rich genoise batter is swirled with melted bittersweet chocolate to make indulgent, little sponge cakes. The elegant cakes are perfect for luncheons, hostess gifts or simply serve them with a cup of French coffee or a Café Creme. You will be surprised at how simple it is to make these little cakes, and once made they will quickly become a favorite, alongside other classic French cakes, I promise. Using a stand or hand mixer, cream the butter and granulated sugar on high until it is light and fluffy. Add the melted chocolate and vanilla extract to the butter and mix again. Turn the mixer to low speed and add the eggs, one at a time, scraping down the sides of the bowl with a spatula as needed. Do not rush this process; the slower you add the eggs, the less chance there is of them curdling. Once the eggs are incorporated, beat the mixture on medium-high for about three to four minutes until the mixture has lightened in color a bit and is very fluffy. Do not use the stand or electric mixer for this next step. In a separate bowl, mix together the flour and baking powder. Very gently fold the flour and baking powder into the egg mixture. Once the batter is smooth, cover it and transfer it to the refrigerator for two hours. Generously grease two standard madeleine pans and spoon the cold batter into the molds. Bake them for 10 to 13 minutes, until they are puffed and very lightly browned. Invert the pans onto wire racks and give them a hard tap to remove the cookies from the molds. Serve them warm dusted with a bit of confectioners' sugar for the best flavor. Cook’s note: The trick to getting notoriously stubborn madeleines out of the pan without cracking them is to very generously grease the pan. Butter works best for this recipe, and it gives the added benefit of helping the madeleines achieve their trademark golden color.